Mindfulness has become somewhat of a buzz word recently with the popularisation of yoga and meditation practices spreading from east to west, but what exactly is mindfulness and how does mindfulness in addiction recovery work? Read on to find out more about mindfulness and how it can provide a solid foundation for addiction recovery. Mindfulness very simply is the act of being aware of the present moment. Being mindful means that you are aware of your thoughts and feelings, and ideally, that you can observe them without judgment. Mindfulness has its origins in ancient Hindu, Daoist, and Buddhist meditation practices. The Buddhist approach is perhaps most directly connected to contemporary mindfulness. Buddhist meditation is reliant on two major components: samatha and vipassana. Samatha is related to breathing; observing and controlling the breath in order to calm the mind. Vipassana is meditation that leads you on the path to finding deeper meaning. Both samatha and vipassana are based in mindfulness. While people have been practicing mindfulness meditation for centuries, this practice saw a revival in the 1970’s when Jon Kabat-Zinn brought this traditional practice into the scientific world. Kabat-Zinn, a scientist, writer, and meditation practitioner founded the Mindfulness-Based Stress Reduction Clinic in 1979 and the Centre for Mindfulness in Medicine, Health Care, and Society in 1995. Kabat-Zinn is considered a pioneer for bridging meditation and science, therefore making the concept of mindfulness more accessible and applicable to contemporary Western society. Mindfulness meditation can be done independently or guided in a group or one-on-one setting. A typical mindfulness meditation will consist of focusing your full attention on the breath as it flows in and out of the body. Focusing on each breath in this way allows us to observe thoughts as they arise in your mind. Once these thoughts are noticed, you would then be encouraged to let go of these thoughts without judgment, as if they are bubbles that rise and you are then able to pop. 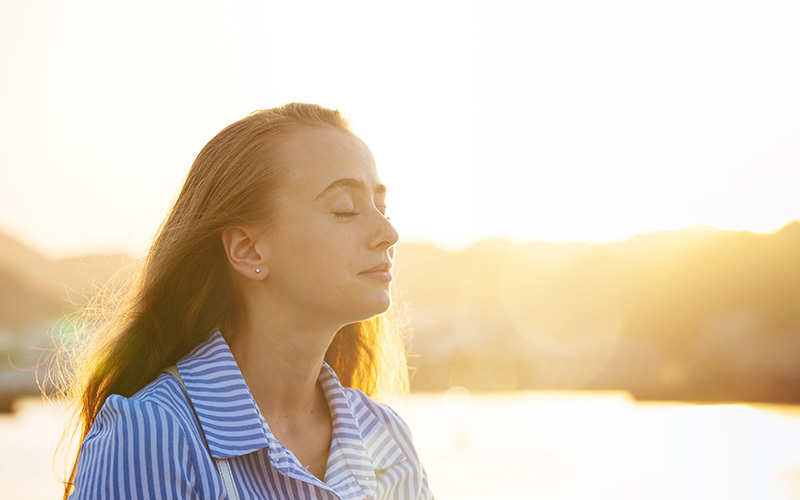 This type of simple breath meditation encourages observation and acceptance without judgment and allows the person meditating to regards their thoughts as transient – coming and going. Outside of the formal meditation setting, mindfulness concepts can and should be applied to everyday life situations. As one advance in their understanding and integration of mindfulness, they might notice newfound abilities to slow down their negatives reaction times, free themselves from harsh self-criticism, and make more informed decisions. Being mindful is a universal skill in all facets of life. How does mindfulness in addiction recovery work? Mindfulness in addiction recovery serves as an effective tool for several reasons. For starters, mindfulness offers a counterpoint for many addictive behaviours. When practiced, mindfulness can give the addict a sense of balance in their lives. For example, addiction is an automatic behaviour used to escape difficult feelings or situations. In contrast, mindfulness involves a conscious and deliberate focus on those same difficult emotions in an effort to confront them directly in a safe setting and interrupt or control negative thought patterns. Through mindfulness practice, the recovering addict can honestly evaluate their addictive behaviours and take responsibility for their actions while developing compassion. Mindfulness also has the capability to physically rewire the brain by changing neural pathways. One study found that certain regions of the brain become thicker with greater mindfulness practice, which promotes a greater sense of well-being and creativity. Other research suggests that mindfulness practice may increase grey-matter density in the amygdala (the area of the brain associated with learning and memory) and can help regulate stress and anxiety. Mindfulness-based stress reduction (MBSR) is a method that has proven effective in combating triggers and preventing relapse among recovering addicts. Stress increases the likelihood of alcohol and drug use, and can precipitate relapses following treatment. Therefore, with MBSR, mindfulness is used to acknowledge cravings as passing thoughts that should be looked upon without judgement or without elevating stress. If the addict is aware that the craving will pass, their need to act on the craving in the short-term will be diminished. In one study comparing MBSR and standard relapse prevention programmes, those who completed the MBSR programme had significantly lower rates of relapse and cravings. Among the many addiction treatment facilities that utilise mindfulness in addiction recovery, The Dawn is a forerunner in its field. The Dawn’s programme is structured on a Twin Pillar approach – one pillar focusing on the psychological work and the second pillar on rebuilding mental and emotional capacities through various alternative approaches including mindfulness. The Twin Pillar approach demonstrates how The Dawn’s treatment programme places equal emphasis on the mental and physical and that mindfulness is engrained in the approach from the onset of treatment through to aftercare. The Dawn employs trained specialists in mindfulness from both scientific and spiritual backgrounds in order to provide clients with a well-rounded understanding of mindfulness so that they can aptly apply it to their own personal recovery plan. If you or a loved one are considering addiction treatment in Thailand, don’t wait and don’t make excuses. Affordable, quality care is available, sometimes you just have to look outside the borders.Book a free consultation today, and take the next step in securing you or your loved one’s future.